I’m following this plan to get back into running as an old fat guy. Summary: run and walk in regular intervals, increasing the amount of time running while decreasing the amount of time walking until you are running for an hour. The first week, you run for 1 minute and walk for 4 minutes, six times (a 30 minute run-walk.) The next week, the run/walk ratio increases to 2/3 and so on. Eventually, in week 12, you are running for 19 minutes and walking for 1 minute, three times. The next week you run for an hour. I like the incremental approach. I’ve added some tweaks to this plan aimed at making the weekly jumps more gradual: this week it’s a 5/3 run/walk ratio, five times (25 minutes of running embedded in a 40 minute session.) I always add enough extra walking at the beginning and the end (as a warm-up/cool-down) to make each venture an hour long. 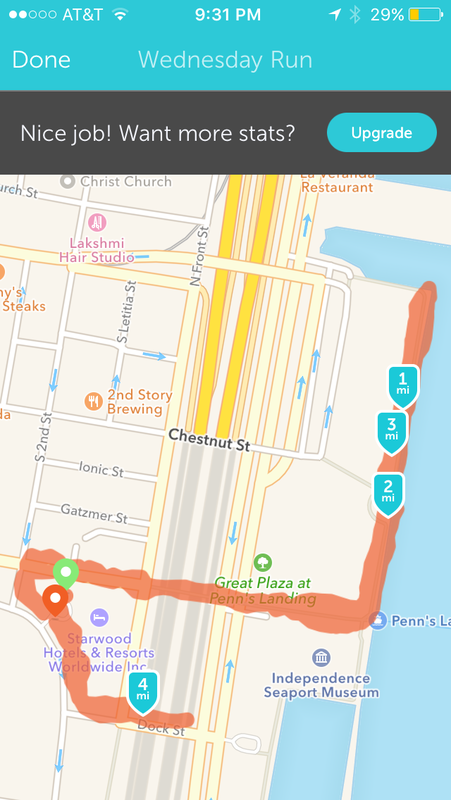 Today I ran/walked 4.1 miles along the Delaware River in Philadelphia. Runkeeper photo below.